This hilarious moment captured from The Dark Knight Rises finds Christian Bale letting off some bat-steam during filming the final installment of the popular franchise. 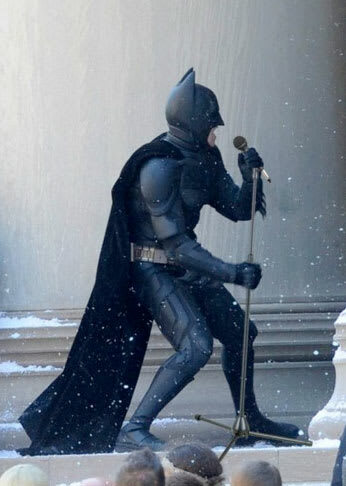 While catering to his inner rock star, the World&apos;s Greatest Detective looks to jumpstart a mega head-bashing concert on the steps of Gotham City Hall. The billionaire bat proceeds to grab the M-I-C and goes H-A-M for a brief moment — much to the chagrin of photogs snooping around. Post up your best caption below, while we try to stop thinking about how awful Batsie&apos;s singing voice is.